I’ve been way lax in posting about my trip to Cork, Ireland for the 2nd International Effects of Noise on Aquatic Life conference, which took place in mid-August. It was such a treat to take part in this gathering of nearly 250 ocean scientists and regulators, leavened with a sprinkling of NGO folks. It was a rare chance for me to actually talk face to face with people who read and circulate AEI’s reports and web content; among the surprises was that German regulators read me as regularly as do their American counterparts, and that the Navy’s marine mammal environmental compliance program is a hotbed of longhairs, in contrast to the toe-the-cultural-line conformity many of us have adopted over the years—bravo! For now, I wanted to at least get my presentation up here and available to those interested. The main theme is that there appears to be a spectrum of individual noise sensitivity, with about 20% being very sensitive to any new noise, 50% largely tolerant of most noise, and 30% in between, responding as the noise gets louder or more intrusive. My initial idea was to share some of this research on humans, and to hear from humans living near windfarms, as a typically “out of the box” AEI approach to exploring questions about why we see such a wide range of responses from marine mammals to ocean noise. But as I prepared the presentation, it began to appear to that there are some fairly compelling indications that this spectrum of noise sensitivity may in fact be a cross-species phenomenon, with many studies of animal disruptions seeming to peak at about half the population being affected. Time will tell whether this is true, and if so, what the implications are. I’m going to continue to explore this theme at a National Wind Coordinating Committee meeting on wind farms and wildlife in October. You can view the Powerpoint here, or click on the link and see it on the Slide Share site, where you can view it larger, or download it. A research team that has been recording whale calls for the past nine years in the Gulf of Mexico has deployed six pop-up recorders in the same area, in hopes of hearing how the local whales are doing in the wake of the Deepwater Horizon disaster. This blog post from Greenpeace summarizes the past and current research in areas 9 and 23 miles from the site of the accident. The post notes the lack of recent whale sitings in the area (though one was seen at a site 63 miles away). I’m not sure what a lack of whales at sites close to the explosion and spill would prove or imply: while the Gulf sperm whales are a resident population, they do range over a region, rather than a neighborhood, and it would be rather surprising if they had lingered near the site of both oil and massive amounts of ship traffic over the past few months. Still, it’s great that there is a baseline of acoustic data for this area, and we’ll certainly look forward to results from this and future years’ studies there. Two interesting though not quite definitive (see update at bottom) news reports came across my desk in the past couple of weeks, both of which signal a potentially dramatic shift away from developing new land-based wind farms in Europe. The Energy Minister of the new UK coalition government as well as the CEO of the Danish government-owned energy company both made public statements suggesting that they will be looking away from further development of wind farms on land, in response to increasing public resistance. In the UK, the Conservative Party reflected the concerns of their largely rural constituency and had expressed far more doubts about large-scale onshore wind farms than had the Labour Party. While Labour’s Energy secretary Ed Miliband said opposing wind farms is “socially unacceptable”, adding society should view people who blocked planning applications in the same light as drivers who refused to wear a seatbelt, the new Energy Minister Lord Marland said in early August that the “future for this country” in terms of wind energy lies in offshore schemes rather than land-band developments that have sparked anger in Westcountry rural and coastal communities. While about 70% of the wind farm project approved by the former government are under construction, Marland stressed that “It is our determination that there should be no dramatic increase in this (wind farms approved by Labour) and that the emphasis should be offshore, where the supply of wind is much more reliable. There are of course constraints in the environment… and fishing and shipping communities need to be listened to, but offshore is the future for this country.” Perhaps most strikingly, the new coalition government plans to abandon a controversial set of local and regional renewable energy targets, which had been driving much of the new wind farm permitting. For more, see this article. And in early September, a short online article from Denmark quoted Anders Eldrup, the CEO of Dong Energy, as saying, “It is very difficult to get the public’s acceptance if the turbines are built close to residential buildings, and therefore we are now looking at maritime options.” According to this article, which appeared on the Copenhagen Post website, it had been Dong and the government’s plan that 500 large turbines be built on land over the coming 10 years, as part of a large-scale national energy plan. This plan has hit a serious stumbling block, though, due to many protests, and the firm has now given up building any more wind farms on land. I have been unable to find any other references to this shift in the online media (UPDATE, 9/12: see this fairly long article in the Telegraph, repeating the quote in more definitive terms, and highlighting Danish anti-wind sentiment) and likewise no public mention of it on Dong’s website; apparently some in the Danish Parliament were unhappy with the idea, so it remains to be seen whether this reflects the CEO’s opinion or substantial new policy. In recent months, a rising tide of protests has appeared in Scandinavia, long at the forefront of wind energy development; this article looks at some of the new resistance. UPDATE 10/27/10: Dong says the original press coverage was “grossly misinterpreted”: This much more detailed article notes that Dong has built no new onshore windfarms in Denmark for 5 years, largely due to the fact that the country already has the highest number of wind turbines per capita in the Europe, so is not now “exiting” online development. The article also downplays the extent of public opposition, and stresses that looking offshore just makes more sense in terms of generating capacity. Dong continues to install land-based turbines in other Scandinavian countries, and is actively pursuing three repowering projects in Denmark (repowering is an upgrade in which aging smaller turbines already in place are replaced by new, larger models, thus generating more power from existing windfarms). This month’s Renewable Energy World podcasts focuses on a question that AEI has been focusing on for the past couple of years: When is wind energy noise pollution? The short online article summarizes a roughly half-hour audio program that centers on three interviews: one with a Texas rancher, one with a couple in Vinalhaven, Maine, and one with yours truly. Intereviewer and Renewable Energy World editor Stephen Lacey did a very good job framing the issue, stressing that while wind energy has great potential for good, it is clearly industrial development and deserves honest scrutiny in terms of its impacts. My part of the conversation begins at about 17:30 and lasts for about eight minutes. Check out the story and podcast here on the Renewable Energy World website. 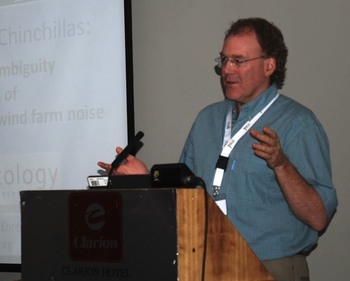 From August 15-20, 250 ocean noise researchers, agency staff, and NGOs gathered in Cork, Ireland for the 2nd International Effects of Noise on Aquatic Life conference. I’ll be posting more on the confab later, but for today I wanted to note the quick jump made by two of the folks I was most glad to finally meet, each of whom headed directly out into the field upon their return home from Cork. Their field blogs certainly remind me that their lives are VERY different than mine, where the post-conference field work involves garden beds burgeoning with beets, carrots, tomatoes, and basil, along with today’s excursion to town, where I write from a shaded cafe table looking up at the Sangre de Cristos in full autumn sun. After leaving Cork, Sarah Dolman touched down only briefly in Edinburgh before heading off to the beautifully foreboding Outer Hebrides, the islands off the country’s northwest shore, where her team is based on the island of Harris and Lewis. The research task at hand is a simple population survey, though in the North Atlantic, it’s often not so simple! The team is posting entertaining recaps of their days on the water (and sometimes limited to cliff-top surveys from shore) at the Whale and Dolphin Conservation Society field blog. Lots of great pictures and tales! Meanwhile, Brandon Southall is basking in relative comfort along the Southern California coast, where the main meteorological challenge has been morning fog. He’s leading the most extensive Controlled Exposure Experiment (CEE) yet undertaken, and is posting daily on his SEAblog. Alternatively known as a Behavioral Response Study, the study aims to place temporary acoustic tags on several species of whales, in order to track their responses to various sounds, which are projected in a controlled way into the water near the tagged whales. The tags record the actual received level of sounds, while also tracking the animals dive patterns and vocalizations. While the project descriptions do not specify the sounds being played, earlier studies have used mid-freqency active sonar sounds, as well as the sounds of predators (orcas), and various artificial sounds; the experiment protocol starts sounds at 160dB, increasing gradually to 210dB re 1uPa, and limits sound exposure to 30 minutes, with long pre- and post-exposure periods that should clarify which behaviors are clearly in response to the sounds. This 6-week project builds on earlier work done on a Naval range in the Bahamas, during Hawaiian Naval exercises, and last summer in the Mediterranean; while these earlier studies focused primarily on very hard to tag beaked and pilot whales, the current study is focusing largely on much more numerous and easier to approach larger whales. Between August 22 and the August 30, they managed to deploy 29 tags and do 14 sound exposures with individuals of three species; by the conclusion of the project on October 1, SOCAL-10 will have a far more robust data set of behavioral responses to sound exposures than has ever been available before. Brandon’s Vimeo page, currently featuring 6 videos, including an hour-long introduction to the project (again, including slides of data from previous CEEs)and a series of short videos from the field, including one of a tag being placed. In Puget Sound, the vulnerable population of 85 resident orcas face a daily onslaught of boat noise, from fishermen, commercial whale watching, and recreational watercraft. Current voluntary guidelines call for boats to remain 100 yards away, and to slow to seven knots when within 400 yards. “People don’t always grasp what 100 yards is,” said Kari Koski, program director for Soundwatch, a project of the local Friday Harbor Whale Museum. “We try to educate them and give boaters the opportunity to make the right decision.” Soundwatch teams that flag down boaters who are too close, or going too fast, find that many local boaters are unaware of the voluntary guidelines, or simply don’t notice the whales nearby. An article this week in the Seattle Times provides a great overview of the on-water education undertaken by Soundwatch, as well as NOAA’s plans for more stringent mandatory rules, which are planned to go into effect next year. NOAA’s proposal calls for 200 yard limits, as well as setting aside the entire west side of San Juan Island as a “no-go” zone for all boats, including kayaks, out to a half mile from shore. The proposal was released in 2009, with comments accepted into early 2010, and a final decision expected sometime soon. See this earlier AIEnews post for more on the proposal, and reactions from locals; this earlier post looks at some of the research underway to assess the effects of boat noise on orca communication (it makes them call louder) and foraging (it may cause them to expend more energy finding food).